There are currently no reliable predictive factors for gastric cancer recurrence. The aim of this study was to evaluate the relationship between bcl-2 expression and risk of gastric cancer recurrence. From January 1996 to December 2007, 449 gastric cancer patients who underwent curative resection were retrospectively studied. The expression levels of bcl-2 were examined by immunohistochemistry. Logistic regression was performed to identify independent risk factors for overall recurrence of gastric cancer. 151 patients (33.6%) experienced recurrences. The median time to recurrence was 17.0 months, 113 (74.8%) patients had recurrences within 2 years. Peritoneal recurrence was the most prevalent pattern, followed by hematogenous metastasis in which the liver was the most common site. Depth of invasion, lymph node metastases, and negative expression of bcl-2 were independent risk factors for overall recurrence. The overall survival time of recurrent patients was 22.7 months. The median survival time after recurrence was 6.7 months. The depth of invasion, lymph node metastases and expression of bcl-2 are independent factors for predicting gastric cancer recurrence. Although the incidence of gastric cancer has been declining substantially for several decades, it is still the fourth most common cancer and the second most frequent cause of cancer death [1, 2]. Although the majority of patients with early-stage gastric cancer can have long survival times after surgery, approximately 40% of patients die from recurrence, even after undergoing curative surgery . The presence or absence of recurrence is widely considered to be the most important predictor for survival, as the prognosis for patients with recurrence is extremely dismal. Therefore, it is very important to precisely predict the risk of recurrence at an early stage in order to improve prognosis of patients with recurrence. However, it has been demonstrated that routine followup after surgery for gastric cancer is not helpful in detecting recurrence at an early stage . Therefore, it is essential to investigate specific factors that can identify subgroups of patients with more aggressive disease. Recently, some studies have shown that pathological factors such as lymph node status, depth of invasion, and tumor size, play a crucial role in predicting recurrence after gastrectomy [5, 6]. However, it is difficult to predict recurrence using common clinicopathological factors. Given that some biological markers, such as oncogenes, tumor-suppressor genes, cell-cycle regulators, and DNA repair genes, are related to tumor genesis, growth, invasion and metastasis, many investigators are searching for new predictive factors among these molecular markers. In a previous study, we evaluated the prognostic value of biological markers such as p53, bcl-2, bax, and c-myc in gastric cancer, and found that bcl-2 was significantly associated with prognosis in gastric cancer patients . Therefore, we hypothesized that bcl-2 expression may reflect tumor characteristics, and thus, serve as a reliable indicator for predicting recurrence. The objective of the current study is to determine whether bcl-2 expression can predict disease recurrence after curative resection in patients with gastric cancer. Between January 1996 and December 2007, 4,426 patients with histologically confirmed primary gastric adenocarcinoma underwent gastrectomy at the Department of Gastric Cancer and Soft Tissue Sarcoma in Fudan University Shanghai Cancer Center. Out of these patients, 449 cases were selected. These patients’ specimens were stained immunohistochemically. Data were retrieved from patients’ operative and pathological reports. Follow-up data were obtained by phone, letter, and the outpatient clinical database. Staging was performed according to the Union for International Cancer Control (UICC) TNM Staging Classification for Carcinoma of the Stomach (Seventh Edition, 2010) . A followup of all patients was carried out according to our standard protocol (every three months for at least 2 years, every 6 months for the next 3 years, and after 5 years every 12 months for life). The check-up items included physical examination, tumor-marker examination, ultrasound, chest radiography, computed tomographic scan, and endoscopic examination. The range of the followup was from January 1996 to May 2010. The median follow-up time was 76.5 months at the time of analysis. Written informed consent had been obtained from all the patients, and this study was approved by the Ethical Committee of Shanghai Cancer Center of Fudan University. The study was retrospective. Bcl-2 was detected by the immunohistochemical method. Antibodies were purchased from Dako (Hamburg, Germany). Immunohistochemical staining was performed by the enhanced labeled polymer system method. Paraffin sections were deparaffinised with xylene and hydrated with ethanol/deionized water. Sections were then incubated with methanol/0.3% H2O2 and blocked with non-specific staining blocking reagent. After overnight incubation at 4°C with anti-bcl-2 antibody (diluted 1:100), sections were treated according to standard immunoperoxidase methods. Negative control sections were subjected to the same procedure, except that the first antibody was replaced by PBS. No positive staining was observed in the controls. The location of staining for bcl-2 was predominantly in cytoplasm and cytomembrane. All slices were independently evaluated by two pathologists. The percentage of immunoreactive cells and staining intensities were evaluated. The percentage of immunoreactive cells was graded on a scale of 0 to 4: no staining was scored as 0, 1 to 10% of cells stained scored as 1, 11 to 50% as 2, 51 to 80% as 3, and 81 to 100% as 4. The staining intensities were graded from 0 to 3: 0 was defined as negative, 1 as weak, 2 as moderate, and 3 as strong, respectively. The raw data were converted to an immunohistochemical score (IHS) by multiplying the quantity and intensity scores. An IHS score of 9 to 12 was considered as strong immunoreactivity (+++), 5 to 8 as moderate (++), 1 to 4 as weak (+), and 0 as negative (-). Cases with a score of less than 1 were considered as negative, and those with ≥1 were regarded as positive . Data were presented as the mean ± SD or the median for numeric parameters. The patients’ features and clinical characteristics were analyzed using the two-tailed Student t-test or Pearson chi-square test as appropriate. Factors that were deemed of potential importance on univariate analysis were included in the multivariate analysis. Logistic regression was used to estimate related factors for recurrence. The accepted level of significance was P < 0.05. Statistical analyses and graphics were performed using the SPSS 13.0 statistical package (SPSS, Inc., Chicago, IL, USA). The study included 307 male and 142 female patients (2.2:1) with a mean age of 57 years. There were 49 (10.9%) early gastric cancers and 400 (89.1%) advanced gastric cancers. According to histological type, well-differentiated tumors were observed in 7 (1.5%) patients, moderately-differentiated in 149 (33.2%) patients, and poorlydifferentiated tumors in the remaining 293 (65.3%) patients. According to Borrmann type, 49 (10.9%) were type 0, 32 (7.1%) type I, 14 (3.1%) type II, 333 (74.2%) type III, and 21 (4.7%) type IV. Of these patients, 147 (32.7%) had tumors located in the upper third of the stomach, 65 (14.5%) had tumors in the middle third, 212 (47.2%) had tumors in the lower third, and 25 (5.6%) had tumors occupying two-thirds or more of the stomach. Lymph node metastasis was observed in 326 patients, and the metastasis rate was 72.6%. The distribution of pathological stage was as follows: 35 (7.8%) patients belonged to stage IA, 34 (7.6%) IB, 50 (11.1%) IIA, 75 (16.7%) IIB, 82 (18.3%) IIIA, 80 (17.8%) IIIB, and 93 (20.7%) IIIC. Bcl-2 expression was positive in 21.2% of all gastric cancer tissues. Bcl-2 staining was observed in the cytoplasm and cytomembrane of carcinoma cells (Figure 1). Bcl-2 expression was associated with pathological stage. There was no correlation between bcl-2 and other pathological parameters, such as age, gender, histological type, Borrmann type, tumor location, or tumor size. Positive expression of bcl-2 immunohistochemistry in gastric cancer tissue. A original magnification ×100, B original magnification ×400. Recurrence occurred in 151 (33.6%) patients during the follow-up period. The median time to recurrence was 17.0 months (range from 2.0 to 91.0 months), and the mean time was 21.1 months. Among patients with recurrence, 113 (74.8%) had recurrence within 2 years. 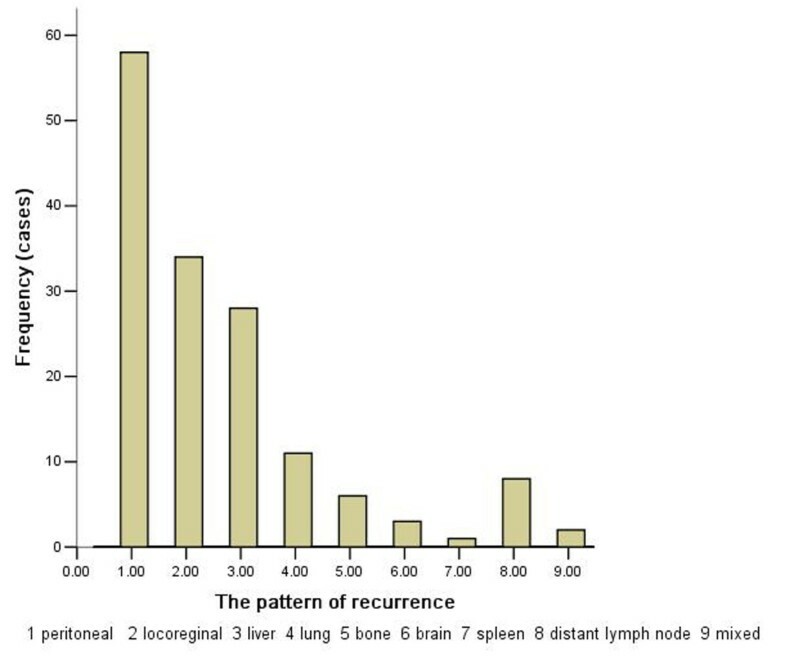 The frequency and rate of recurrence are demonstrated in Figure 2. Frequency of recurrence after curative operation by year. Of the 151 patients with recurrence, 58 (38.4%) were diagnosed with peritoneal recurrence, which was the most prevalent, 49 (32.5%) patients had hematogenous metastases, which was the second most common recurrence pattern, and liver was the most frequently involved organ; it was implicated in 57.1% of all recurrent patients. Other recurrences were loco-regional (n = 34, 22.5%), distant lymph node metastases (n = 8, 5.3%), or at multiple sites (n = 2, 1.3%) (Figure 3). Pattern of recurrence of after curative gastrectomy. Univariate analysis showed that Borrmann type, depth of invasion, lymph node status, and expression of bcl-2 were associated with overall recurrence, whereas age, gender, histological type, tumor location, and tumor size were not (Table 1). Logistic regression was employed to identify the independent risk factors for overall recurrence. It was demonstrated that depth of invasion, lymph node metastases, and negative expression of bcl-2 were independent predictive factors for overall recurrence (Table 2). Univariate analysis showed that Borrmann type, depth of invasion, lymph node status, histology, gender, and expression of bcl-2 were associated with peritoneal recurrence. Logistic regression showed that depth of invasion, lymph node status, histology, and bcl-2 were independent predictive factors for peritoneal recurrence. Tumor location and Borrmann type were related to hematogenous metastases, and tumor location was the only independent predictive factor. 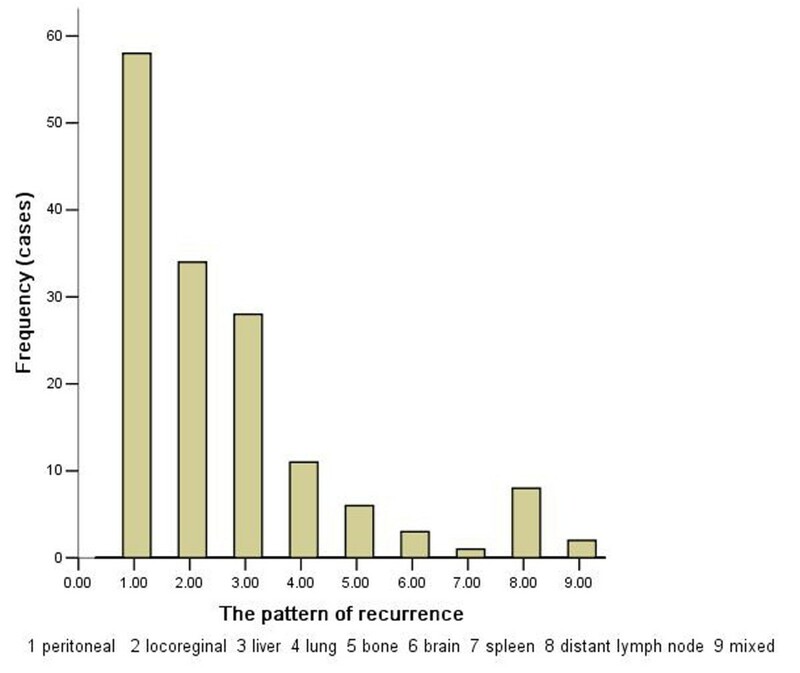 There was no correlation between clinicopathological parameters and loco-regional recurrence. The overall 5-year survival rate was 52% for all patients. Five-year survival rate was 58.9% and 45.5% in bcl-2 positive and bcl-2 negative patients respectively. In bcl-2 positive patients, pathological stage and tumor location significantly affected prognosis, and pathological stage was an independent prognostic factor. In bcl-2 negative patients, univariate analysis showed that Borrmann type, depth of invasion, lymph node metastases, tumor size, tumor location and pathological stage significantly affected prognosis. Multivariate analysis showed that lymph node metastases, tumor location, and pathological stage were independent prognostic factors. The median survival time of patients with recurrence was 22.7 months. The median survival time after recurrence was 6.7 months. According to the different recurrence patterns, the median survival time after peritoneal recurrence, hematogenous metastases, loco-regional recurrence, and distant lymph node metastases were 5.7 months (2.6 to 12.4), 7.3 months (2.4 to 11.7), 7.0 months (2.5 to 17.1), and 6.1 months (3.9 to 7.9), respectively. Patients with peritoneal and distant lymph node recurrence had a shorter survival time; however this was not statistically significant. The main findings of this study were that (1) peritoneal recurrence was the most prevalent recurrence pattern after curative surgery, and (2) the depth of invasion, lymph node metastases and negative expression of bcl-2 were independent risk factors for overall recurrence. Gastric cancer is one of the most common malignancies worldwide. Although the prognosis of patients with gastric cancer has improved as a result of better diagnostic techniques and therapeutic strategies, gastric cancer is still the second leading cause of cancer-related deaths . The dismal prognosis of gastric cancer is due principally to the frequency of recurrence and metastasis. Therefore, it is very important to clarify the pattern of recurrence and the risk factors for recurrence, which can contribute to the conduct of postoperative clinical practice and followup. In our study, 151 (33.6%) patients had recurrence during the follow-up period. The mean time to recurrence was 21.1 months; 113 patients (74.8%) had recurrence within 2 years. This result shows that most gastric cancer recurrence occurs within 2 years, and is consistent with other studies [10–12]. Yoo et al. 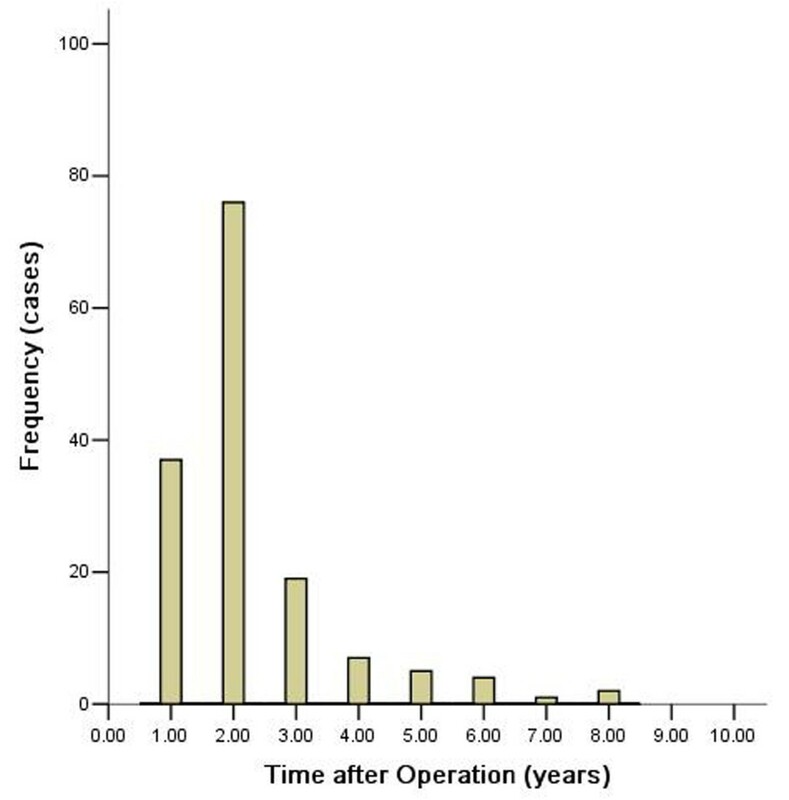 reported 508 patients with recurrence after curative resection for gastric cancer and showed that the mean length of time to recurrence was 21.8 months. Therefore, it was necessary to reinforce the followup within 2 years after curative resection. It has been reported that the most common recurrence patterns are hematogenous recurrence and peritoneal dissemination in gastric cancer [3, 12–14]. In our series, peritoneal recurrence was the most common pattern, accounting for 38.4% of all patients with recurrence, followed by hematogenous metastases (32.5%). Our results are consistent with previous studies [3, 12]. Maehara et al. reported  that the peritoneal pattern accounted for 50% of cases, hematogenous recurrence for 40% of cases, and loco-regional recurrence for 20%. However, there are still some disputes. An Italian study showed that the most common recurrence pattern was loco-regional, accounting for 45% of all recurrent cases . This disparity indicated that there are some differences in recurrence patterns between Eastern and Western countries. It is possible that the low incidence of local recurrence in Eastern studies is due to the extensive use of D2 lymph-node dissection. Recurrence is frequent in gastric cancer patients after undergoing radical gastrectomy. Therefore, it is important to identify patients at a high risk of recurrence. In this study, univariate analysis showed that Borrmann type, depth of invasion, and lymph node status were associated with overall recurrence. Logistic regression demonstrated that depth of invasion and lymph node metastases were independent risk factors for overall recurrence. Consistent with our findings, previous studies have showed that traditional clinicopathological factors such as serosal exposure, histological type, depth of invasion, and lymph node metastasis were risk factors for recurrence [17–19]. However, traditional clinicopathological factors are sometimes inadequate for prediction of recurrence. A number of studies have indicated that biomarkers, such as tumor markers [20, 21], vascular endothelial growth factor (VEGF) family [22, 23], E-cadherin [24, 25], and microRNAs , might be useful for predicting recurrence of gastric cancer. Bcl-2 located at chromosome 18q21, and encodes a 26-kDa protein localized mainly in the mitochondrial membrane . The bcl-2 gene was first described as an oncogene in follicular lymphoma. Some studies have shown that overexpression of bcl-2 suppressed cellular proliferation and was associated with less aggressive biological behaviour [28, 29]. However, the value of bcl-2 in predicting gastric cancer recurrences is still unclear. In a previous study, we found that bcl-2 was significantly associated with prognosis in gastric cancer patients . Therefore, we hypothesized that bcl-2 might reflect the biological nature of the tumor, and would serve as a reliable indicator for predicting recurrence. According to our results, the negative expression of bcl-2 is an independent risk factor for gastric cancer recurrence. The exact mechanism is still unclear. It is possible that bcl-2 affects gastric cancer recurrence by regulating the tumor cell biological behaviour. Saegusa et al. reported that the majority of bcl-2+ cancer cells are in a nonproliferative state, and the average expression of Ki-67 labeling index and apoptotic labeling index in bcl-2+ foci are significantly lower than that in bcl-2 foci. Aizawa et al. showed that the expression of bcl-2 in advanced gastric cancer is associated with a lower apoptotic index and a better prognosis. Pietenpol et al. reported that over-expression of bcl-2 inhibits the growth of several solid-tumor cell lines. In conclusion, the present study demonstrated that peritoneal recurrence was the most common recurrence pattern after curative gastrectomy. Depth of invasion, lymph node metastases, and negative expression of bcl-2 predict greater risk of recurrence. These findings may provide some useful information for followup in gastric cancer patients who have undergone surgery for resection. Specifically, it is necessary to conduct an intensive follow-up plan for gastric cancer patients with negative expression of bcl-2. However, the small scale and the retrospective design were shortcomings of the current study. Further large-scale, prospective studies should be performed to validate the usefulness of bcl-2 in detecting tumor recurrence in patients with gastric cancer. Jianghong Wu, Xiaowen Liu contributed equally to this work. We thank Ben Liotta for editing the English language in our manuscript. JHW, XWL and YNW conceived and designed the experiments. JHW and XWL performed the experiments. JHW, XWL and HC analyzed the data. HC and YNW contributed reagents/materials/analysis tools. JHW and XWL wrote the paper. All authors read and approved the final manuscript.